Put On Your Disco Boots and Channel Your Inner Dancing Queen as HMC Celebrates One of the Greatest Bands in Pop Music History! Featuring 17 of ABBA’s Most Iconic Hits! 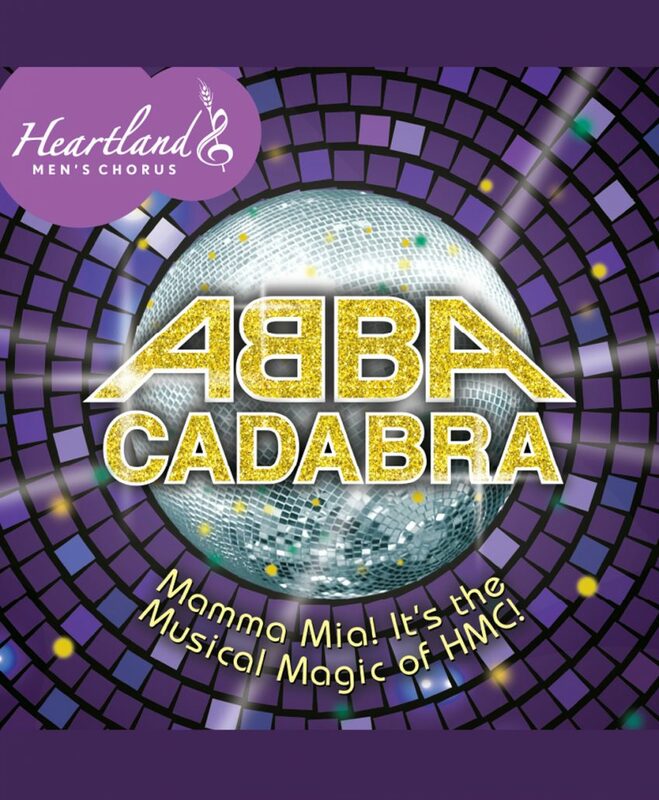 KANSAS CITY, MO (February 12, 2017) — Heartland Men’s Chorus (HMC), announced Monday their 32nd season continues in March with ABBA-Cadabra! Who better to bring one of the greatest pop phenomenons in the history of music back to life than Kansas City’s gay men’s chorus! Featuring the most iconic hits from one of the world’s most beloved bands, ABBA-Cadabra will be a musical extravaganza that includes a full evening of toe-tapping ABBA favorites. It will take you back to the 1970’s and have you screaming, “Thank you for the music” before the curtain falls. The ABBA phenomenon began in 1974 in Brighton, England, where “Waterloo” became the winner of the Eurovision Song Contest. That hit song was truly the break through for the quartet, made up of Swed’s Agnetha Faltskog, Bjorn Ulvaeus, Benny Andersoon and Anni-Frid Lyngstad, who, with their short skirts and headbands, would go on to sell more albums than any other group second only to The Beatles. They ruled the international disco music market for a decade with their long blonde hair and their long list of chart topping music. “Does Your Mother Know” – This 1979 single was atypical but a fun piano-driven, boogie-disco song that will truly be performed “HMC style” with tons of fun! “Super Trouper” – One of ABBA’s biggest hits that begs to be sung at the top of one’s lungs, it opens with a cappella magic then finds the addictive staccato chorus. “Mamma Mia” – Undoubtedly set in history by the Broadway play and the movie led by Academy Award Winner Meryl Streep, no ABBA show is complete without it. “Dancing Queen” – No ABBA concert produced by a gay men’s chorus would be complete without the iconic “Dancing Queen.” It is the masterpiece that’s outlasted the disco era to become a standard of modern-day dance music that can get a room moving with its opening notes. ABBA-Cadabra will be performed at 8 p.m. Saturday, March 24th and 4 p.m. Sunday, March 25th in the C. Stephen Metzler Hall at the historic Folly Theater, 300 W. 12th Street, in downtown Kansas City, Missouri. Tickets to both performances are available online at http://hmckc.org/tickets/ or by calling 816-931-3338. Prices range from $18 to $43 with special student pricing at $7. Come as you are. Or come dressed as ABBA! But visit hmckc.org today! Visit www.hmckc.org for more information about Heartland Men’s Chorus 2016-2017 season. High-resolution photos of the 2016-2017 Season can be obtained by contacting the chorus office at 816-816-931-3338. Information for Folly Theater parking can be found online at www.follytheater.org. The parking garage, immediately west of the Folly Theater, is the primary parking garage for Heartland Men’s Chorus patrons. Event parking is $8 per car and may be purchased upon arrival (cash only at the gate). HMC’s 32nd Season is underwritten by Hotel Phillips. Other sponsors include the Muriel McBrien Kauffman Foundation; Missouri Arts Council; Hall Family Foundation, Richard J. Stern Foundation for the Arts, Arts Council of Greater Kansas City, and the Kansas City Neighborhood Tourist Development Fund (NTDF). Student tickets are available for $7 (with valid ID, one ticket per ID). They may be purchased in advance by calling the HMC box office at 816-931-3338 or at the door prior to the performances based on availability. The Box Office opens one hour prior to all performances. Receive updates by joining Heartland Men’s Chorus’ Page at www.facebook.com/hmckc and following @hmchorus on Twitter. Friday, Nov. 10, 7:30 p.m. Sat., Dec. 2, 8:00 p.m. Sun., Dec. 3, 4:00 p.m. Sat., Dec. 9, 8:00 p.m. Sat., Mar. 24, 8:00 p.m. Sun., Mar. 25, 4:00 p.m.
We hope you’ll put on your disco boots and channel your inner dancing queen as HMC celebrates one of the greatest bands in popular music history. Featuring everything in the ABBA repertoire from “Take a Chance on Me!” to “Mamma Mia,” you’re sure to be singing at the top of your lungs before the curtain falls. We plan to be completely silly and have a great time to say, “Thank you for the music!” Single tickets available now. Sat., June. 9, 8:00 p.m. Sun., June 10, 4:00 p.m. Ever wonder about the phrase “With Liberty and Justice for All?” We certainly do and with the prejudice, inequality, bias and discrimination happening in the world around us, Heartland Men’s Chorus will present our response, “Indivisible.” HMC will be joining forces with the National World War I Memorial and Museum to celebrate the principles of our great nation’s founding . . . that ALL are created equal. Single tickets available online beginning Monday, March 26. Please direct all media inquiries to Rick Fisher, 816-931-3338 or hmc@hmckc.org.